This South African trumpeter scored a massive worldwide hit with “Grazing In The Grass,” becoming one of the biggest names in African music in the process. South African trumpeter Hugh Masekela has at times been cursed in his life. But he’s emerged on the other side, coming back strong since the end of apartheid, settled back at home, having conquered demons personal and political. He is still making music on the cornet and flugelhorn and singing. Hugh Ramopolo Masekela was born on 4 April 1939 in Witbank, near Johannesburg. Masekela showed musical ability from a young age, and began to play piano as a child. Inspired by the movie Young Man with a Horn, Masekela began to play the trumpet, encouraged by anti-apartheid activist Father Trevor Huddleston, who helped him acquire the instrument. At Huddleston’s request, Masekela then received tuition in trumpet playing form Uncle Sauda, who played for the Johannesburg ‘Native’ Municipal Brass Brand. Masekela soon mastered the trumpet, and began to play with other aspiring musicians in the Huddleston Jazz Band – South Africa’s first youth orchestra. As the apartheid situation in South Africa worsened, Masekela left for London, then New York, where friends (principally countrywoman Miriam Makeba, to whom he was briefly married) helped him land a place at the Manhattan School of Music. Masekela played on the Byrds’ classic rock hit “So You Want To Be A Rock And Roll Star” and performed at the legendary Monterey Pop Festival in the summer of ’67. Already unclassifiable because of the breadth of his music, the next year “Grazin’ In The Grass” made him a huge pop star with its laid-back, easy vibe, hitting the charts in several countries—it reached number one on the Billboard pop and R&B charts in America. The track itself was just filler, recorded in half an hour, but it brought him international fame; suddenly, he was a headlining name. Then, in 1972, he turned his back on all that, and headed back to Africa. After moving through several countries, he hooked up with Afrobeat pioneer Fela Kuti, who introduced him to the Ghanaian band Hedzoleh Sound, with whom Masekela recorded a string of hits. In the 1980s, Masekela set up a mobile studio in Botswana, where he further developed his musical style using African mbaqanga strains. Masekela performed with Paul Simon on the Graceland tour, along with Ladysmith Black Mambazo. Masekela defended Simon vigorously when the tour was seen as a violation of the African National Congress’ cultural boycott. His 1987 hit ‘Bring Him Back Home’ became the anthem for Nelson Mandela’s world tour, following his release from prison in 1992. Masekela then returned to England, co-penning the successful musical Sarafina before joining Paul Simon’s Graceland tour. Finally, with the release from prison of Nelson Mandela in 1990, Masekela was able to return to South Africa, recording and touring there once more. Cuba: An African Odyssey is the fruit of fifteen years’ research and organizing on the part of Egyptian Jihan el Tahri. Treating three hot wars within the context of over “a quarter century plus one year, one month and one day” in the life of the larger Cold War. Disguised in 1965, clean-shaved in a suit and thick-rim glasses, Che Guevara is another man — on shipping across Lake Tanganyika into the Belgian Congo/Democratic Republic of the Congo/Zaïre — to bring revolutionary expertise to those fighting for the leftist MNC ideals of popular PM Patrice Lumumba, usurped and murdered by Col. Joseph Mobutu. 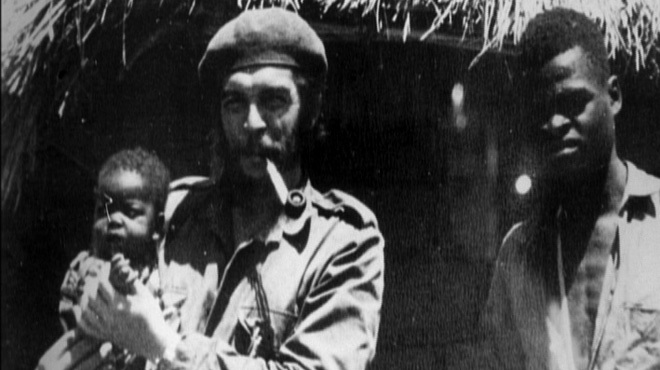 Before his own failure, capture and murder, Che would take Bolivian guerrillas to task on “the reality of war. I emphasized the importance of a united command and discipline . . . of the party’s line.” Unable to inculcate military or ideological order, Guevara left Africa secretly after eight months. Fidel was so joyfully embraced in Angola’s capital, Luanda, that his visit was extended into a three-week triumphal tour. Already suffering privation, and later itself to lose Soviet aid, his own island had given its lifeblood for emerging brother nations: the remains of ten thousand of Cuba’s fallen (many of them at Cuito Cuanavale, the greatest battle on the continent since El Alamein) were transported home for burial. The legwork research here is impressive, even for those who question El Tahri’s hagiographic treatment. Protagonists’ motivations and actions are of course open to different interpretation, with interviewees on whatever side seemingly likeable, eloquent and sometimes surprisingly humorous about the past. On October 14, 1975, as Angolan independence approached and the civil war tipped in favour of the Marxist Popular Movement for the Liberation of Angola (MPLA), the South African armoured column Zulu crossed into Angola. Made up of white troops from the South African Defense Forces (SADF) assisted by several thousand black mercenaries, Zulu rolled over the MPLA’s few defences and started racing for the capital, Luanda. Joining Zulu came a second column, Foxbat, airlifted into the central Angolan town of Silva Porto—a gangster’s Shangri La and home to the warlord Jonas Savimbi and his murderous National Union for the Total Independence of Angola (UNITA). Meanwhile, from the north came another anti-Communist guerrilla army, Holden Roberto’s National Front for the Liberation of Angola (FNLA), which was saturated with CIA personnel, South African military advisors, and Zairian troops, plus some Portuguese and British soldiers of fortune. This secret invasion code named “Operation Savanna” was just the culmination of an older U.S.-backed, Kissinger-approved program of covert action which had begun half a year earlier when it became clear that an exhausted Portugal was giving up on its colonial project and that the Marxist MPLA would win the civil war between itself and the two anti-Communist groups, UNITA and the FNLA. Formal decolonization was set for November 11, 1975, and the CIA/South African invasion was an attempt to steal Angola away from the MPLA before that legitimizing date. Also on the ground were five hundred volunteer Cuban military advisors who had been training and fighting alongside the MPLA for the last two months, but many of this number were in the country’s detached northern oil-rich enclave, Cabinda. The speed and secrecy of the South African blitzkrieg stunned both the MPLA leadership and the Cubans. Less than three weeks after invading, Zulu was almost upon Luanda, yet the head of the Cuban military mission, Diaz Argüeselles, still did not grasp the magnitude of the situation. A few days later, the Cubans and the MPLA leadership were disabused of their confusion when all the coastal highway towns south of Luanda had fallen to Zulu. Within hours it became clear to the MPLA and their Cuban comrades on the ground—and then to Fidel and his brother Raul Castro—that they must choose either to abandon Angola to the ravages of South Africa and its proxy warlords or send immediate reinforcements. After consulting with Raul and a few top aids, Fidel dispatched 430 members of the Special Forces and an artillery regiment. Most would go by boat arriving in about a week, but a vanguard detachment of 158 elite Cuban commandos and heavy weapons specialists dressed in civilian clothes boarded two passenger planes and took off for Angola. Before they left Fidel met them on the tarmac. “He spoke most of all about the South African invasion,” recalled one veteran of the operation. “He said that some of the Cuban instructors had died, that it was a difficult situation, that we must stop the South Africans before they reached Luanda and that many of us would not return. He said that it was very hard for him to say this and not go with us.” Even more chilling were the final instructions: fight with the MPLA, if the MPLA lost the capital go to the hills and fight on, if the MPLA gave up—only then, if possible—the survivors should fall back to Zambia where Cuba had a new embassy. After two stops for refuelling, the Special Forces touched down in Luanda under the cover of night and immediately raced to the nearby bluff-top village of Quifandongo from which the MPLA was guarding the capital with several hundred of its best troops, some artillery pieces and six Soviet-made rocket launchers. Just outside Quifandongo lay Holden Roberto’s FNLA, a host of 3,500 mounted on trucks, tanks, and mobile artillery, massing for their final assault on Luanda. The FNLA forces—described by a South African veteran as a “hoard of partly trained…tribesmen…Portuguese mercenaries…[and] faint-hearted Zairians…” held together by a few SADF officers and CIA advisors—lined up on the road to attack as a convoy. Greeting them was an awful hail of Cuban controlled artillery. As one discouraged white advisor later wrote, “one by one the armoured cars were knocked out.” Mauled and panicked, the attackers scattered. News of South Africa’s humiliation in Angola swept the Bantustans electrifying and emboldening ANC activists and youth. A few months later the ghetto of Soweto exploded, marking the beginning of the end of apartheid. Impressive as it may be, the Cuban adventure in Angola was only one piece of a truly audacious African foreign policy. Cuba was not a Soviet pawn in Angola or elsewhere. In fact, in the majority of these interventions the Cubans played a leading role, sometimes acting against the wishes of the Soviet Union. In Angola, for example, the MPLA had been requesting direct military intervention—troops—from both the USSR and the Cubans starting in early 1975. But these socialist states held off: Cuba for fear of antagonizing the United States; the USSR in the hope of achieving a new arms agreement. When Cuba finally acted it did so without consulting the Soviets. And when the Russian “elder brothers” were presented with the fait accompli of Cuban troops duking it out with South African invaders, requests from Castro and the MPLA for military aid contained as much blackmail as they did supplication. What were the Russians to do—let the Cubans sink? Of course once the tide had turned, the independence date had come, and South Africa had finally been exposed in the western press as the aggressor, the USSR was happy to help out. Cuba’s interventions were not always victorious. Che’s year in what is now called the Democratic Republic of Congo was a socialist Heart of Darkness. Che’s host, the dashing, seemingly committed Laurent Kabila turned out to be a soft, jet-setting fundraiser who frequented foreign capitals while his troops languished in the jungles around Lake Tanganyika. Che tried to turn things around but Kabila’s Simbas (meaning lions) preferred to lay low while a U.S.-backed army of white mercenaries supported by Cuban-American pilots had its way with the geographic heart of Africa. Likewise a leftist coup in the nearby French Congo turned out to be heavy on radical pronouncements but light on actual socialist forward motion. The Cuban mission there—to train a more left-leaning popular militia—ended after a right-wing coup. The Cubans risked all for leaders they liked and respected while often suffering chilly relations with groups that might seem their natural allies. Che set the initial tone in most of these cases during his diplomatic barnstorming through Africa in late 1964 and early 1965. At times the connections and near misses seem counterintuitive. For example, Che offended and alienated the very Marxist, Cuban-oriented Front for the Liberation of Mozambique, but quickly bonded with the ideologically more eclectic, more social democratic, Amilcar Cabral of Guinea Bissau’s liberation movement. In later years this meant scant Cuban involvement in Mozambique and a huge military and medical assistance package for Cabral’s forces in Guinea Bissau. Stephen Bantu Biko was a giant in the struggle against South Africa’s white minority rule and one of its most well-known martyrs. Born in Tylden, in the Eastern Province (now Eastern Cape), on 18 December 1946, he was a prodigious student in a system with designed policies to curtailed any kind of black emancipation. From a very early age he rebelled against this repressive apparatus. He was briefly expelled from school due to “a strong resentment toward white authority”. At university Biko formed the South African Students Organisation, raising awareness of how black students suffered compared to their white counterparts. Biko’s tragic death, at tender age of 30, had a great impact on the people of South Africa and stunned the world. His funeral was attended by more than 15,000 mourners. Sorry for the poor quality of the audio but please listen to them carefully, especially part 3. “You are either alive and proud or you are dead, and when you are dead, you can’t care anyway. And your method of death can itself be a politicizing thing. So you die in the riots. For a hell of a lot of them, in fact, there’s really nothing to lose – almost literally, given the kind of situations that they come from. So if you can overcome the personal fear for death, which is a highly irrational thing, you know, then you’re on the way. And in interrogation the same sort of thing applies. I was talking to this policeman, and I told him, ‘If you want us to make any progress, the best thing is for us to talk. Don’t try any form of rough stuff, because it just won’t work.’ And this is absolutely true also. For I just couldn’t see what they could do to me which would make me all of a sudden soften to them. If they talk to me, well I’m bound to be affected by them as human beings. But the moment they adopt rough stuff, they are imprinting in my mind that they are police. And I only understand one form of dealing with police, and that’s to be as unhelpful as possible. So I button up. And I told them this: ‘ Its up to you.’ We had a boxing match the first day I was arrested. Some guy tried to clout me with a club. I went into him like a bull. I think he was under instructions to take it so far and no further, and using open hands so that he doesn’t leave any marks on the face. And of course he said exactly what you are saying just now: ‘ I will kill you.’ He meant to intimidate. And my answer was: ‘How long is it going to take you?’ Now of course they were observing my reaction. And they could see that I was completely unbothered. If they beat me up, it’s to my advantage. I can use it. They just killed somebody in jail – a friend of mine- about ten days before I was arrested. Now it would have been bloody useful evidence for them to assault me. At least it would indicate what kinds of possibilities were there, leading to this guy’s death. So, I wanted them to go ahead and do what they could do, so that I could use it. I wasn’t really afraid that their violence might lead me to make revelations I didn’t want to make, because I had nothing to reveal on this particular issue. I was operating from a very good position, and they were in a very weak position. My attitude is, I’m not going to allow them to carry out their program faithfully. If they want to beat me five times, they can only do so on condition that I allow them to beat me five times. If I react sharply, equally and oppositely, to the first clap, they are not going to systematically count the next four claps, you see. It’s a fight. So if they had meant to give me so much of a beating, and not more, my idea is to make them go beyond what they wanted to give me and give back as much as I can give so that it becomes an uncontrollable thing. You see the one problem this guy had with me: he couldn’t really fight with me because it meant he must hit back, like a man. But he was given instructions, you see, on how to hit, and now these instructions were no longer applying because it was a fight. So he had to withdraw and get more instructions.